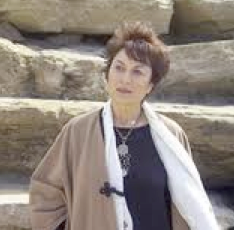 Malka Marom is a fascinating Canadian-Israeli artist, journalist and producer whose interests and talents cross a spectrum that only some artists dream of experiencing. As a child she had a leading role in the first movie ever filmed in Israel. As a folk singer, she introduced world music to North America, with her albums hitting the top of the best selling charts around the world. Her music career helped her hobnob with other famous musicians. Her circle of friends include Leonard Cohen and Joni Mitchell. An interesting fact is that she once dated Bob Dylan in the 70′s which some say was the cause of his bitter divorce with Sara Dylan. When her music career ended, Marom wrote and hosted her own weekly radio show on CBC called Song Of Our People and also City TV’s weekly show Mosaic which featured interviews with known stars such as Joni Mitchell. Her career in journalism along with her interests in culture, spirituality and storytelling pulled her naturally into documentary film making. Her interviews include Moshe Dayan, the infamous one-eyed Israeli general who was a key player in the creation of the State of Israel. Marom’s documentary, The Bedouins, won the Ohio State Award and inspired her to study the language and the lives of the Bedouin people, wanting to know more about their daily life. She was troubled by how the media would focus on the political story around the Bedouins merely being “a bargaining chip for a peace agreement between Egypt and Israel”. 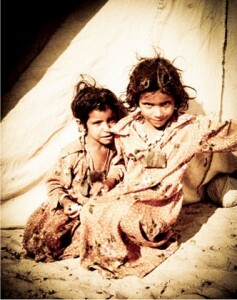 She wanted to tell the human story of the Bedouin people whose rights in Sinai were being ignored. Most of us tend to run from our fears. Or be incapacitated by them. Not Malka Marom. She has spent a lifetime embracing them. Her novel, Sulha , is being celebrated as much for it’s provocative subject matter as for its lyrical writing. Reading Ms. Marom’s novel, you can taste the sand, smell the scorched and smoky firewood that permeates everything. It’s evident she knows what she’s writing about. 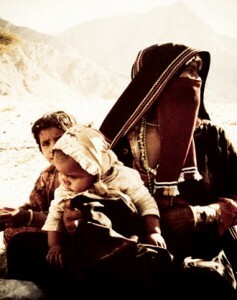 For months, Ms. Marom roamed the desert with five Bedouin clans at different stages of nomadic life. Most people wish to have one successful career in their life – Malka Marom is in the midst of her third. The singer, documentarian, turned author, is promoting the release of her novel Sulha in Canada, Germany and Greece. While her different pursuits may sound like they are unrelated they are all linked by one common thread, “‘an exquisite tension that is created by two opposing poles; the striving to attain the mythic dream of the New World – the pursuit of personal happiness and peace – and the longing for the mythic innocence of the Old Country.’ I think this informs almost everything I’ve done – this tension, this pull. I think it also dictates the way I dress, the way I talk, everything. 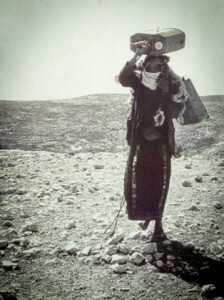 The seeds of her novel Sulha were planted when Malka went to the desert to prepare her award winning documentary: The Bedouins. “The Bedouins have a custom of opening their hearts and revealing their secrets only through parables, legends, poems and stories. 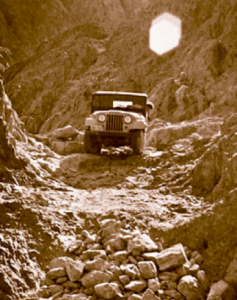 They inspired me to seek out my own parables, legends, stories and secrets.” says Marom. Malka Marom has emerged from the desert, and she is a study in charisma. She strides into her interview smiling with a naked ebullience, resplendent in a thowb – long Bedouin tribal dress – she received from an Arab Bedouin woman of the Sinai desert. That Sinai Bedouin woman likely gave her the elaborate pewter-coloured necklace which adorns her neck, and perhaps too the yellow headband about her temples. Her visitations with the nomadic Bedouins inspired her to write Sulha, her debut novel. 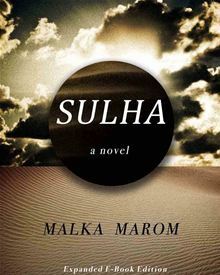 The nearly universal praise of her novel Sulha is reflected in Marom’s sparkling and surprised eyes. Her unpreparedness for the critical enthusiasm complements the uncontrived passages of Sulha. Recent world events have contributed to making Sulha an even more compelling read and certainly, a relevant one. Sulha is really quite a book. It’s subject matter is unusual, even though its theme is a popular one; the search for self. Its writing is very lyrical, at times. Its subject matter is exotic. Its plot and sub-plots aren’t run-of-the-mill. For a first novel, Sulha is a remarkable accomplishment. Remember, English is Malka Marom’s second language and yet she has written a book that is evocative, captivating in parts, lyrical in parts, like a desert ballad or a desert lament… a lament for what happened to “The Dream” – of Israel being “a light unto the nations,”… a lament for the Badouin way of life being subsumed by the lure of modernization.